(CNS): Both Ezzard Miller and Arden McLean are sticking to their position that the national ballot on one man, one vote must take place in November — before the next general election — as a people-initiated referendum, which is provided for in Cayman’s constitution. The two MLAs say past evidence shows that McKeeva Bush is offering nothing more than an empty promise. Miller also noted that a general election result based on the multiple voting system could not be considered legitimate if at the same time the majority of electors were voting for one man, one vote. Thanking the premier for his support for a referendum on the issue, following Bush’s announcement on Friday evening, Miller and McLean said it was “nothing but a naked attempt to stymie the current petition process,” which the MLAs said was receiving wide support. “We remind Caymanians that the premier has made this promise before and has not delivered,” McLean and Miller said in their joint statement issued on Saturday afternoon. “In 2003 as leader of government business, he expended considerable public funds to have the Electoral Boundaries Commission draft up the 18 single member constituencies in preparation for the 2004 elections, only to abort the implementation for his own political expediency, in spite of his party's support for its introduction. “The premier then offered to placate the PPM who supported the introduction of one man, one vote by introducing it for George Town as a test case, again only for his own political purposes.This never happened and the Premier is now merely offering up yet another empty promise on this matter,” the MLAs said. The two men, who are currently the only single members in the Legislative Assembly, asked why the premier would propose that the people of the Cayman Islands must wait five years to enjoy true democracy, better representation and greater accountability of politicians. “Anyone who opposes the implementation of single member constituencies before the 2017 elections is selfish and is not acting in the best interest of the country at this time. Do not trust any of the politicians to implement this system after you vote them into office. This has not worked over the past 10 years. The only way one man, one vote will ever be legislated is through this referendum and the concurrent enforcement of the provisions of the constitution,” McLean and Miller warned. “The benefits achieved by winning the referendum are certainly worth the money spent. 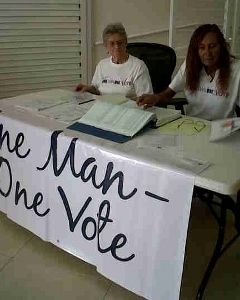 How much is too much to allow Caymanians to express their democratic rights and freedoms?” they asked. Miller said he believs that the general election result in 2013 could not be considered legitimate if people in George Town were allowed to cast six votes and there was, as is anticipated, overwhelming support for one man, one vote. However, speaking with CNS on Saturday, he said he believed this was an attempt by the premier to ensure his own re-election for what may be the last time. The MLAs added that there was now a pressing need to get on with the petition and ensure there would be a referendum in November to give the government ample time to make the necessary changes to the Elections Law, which are very simple and direct, as they encouraged Caymanians to use this announcement by the premier as clear proof that everyone needs to sign this petition. "Let’s get it done for 2013," they said. Organisers now believe they are close to 2,000 signatures all of whom are registered voters — over half way to the figure of 3,800 which would trigger the constitutionally enshrined people-initiated referendum. But Mclean and Miller have set a target of 5,000 to ensure that there is no doubt about the support for the initiative. The campaigners hope to submit the complete petition that calls for a November referendum to Cabinet by the 1 April with the stated goal of having the 2013 election conducted under the democratic and equal system of one man, one vote in 18 single member constituencies. 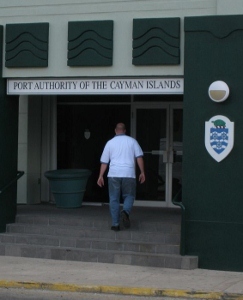 (CNS): The Cayman Islands premier told the Port Authority director that he intended to ask the police to investigate the leakof an MOU he had signed with China Harbour Engineering Company last year as he believed it had come from the port. The revelation comes from the minutes of a Port Authority board meeting in June, which was released on Friday. Following the FOI request made by CNS for access to documentation regarding the collapsed negotiations with GLF Construction and the talks with CHEC over the development of the George Town cruise berthing facilities, the port has posted on its website the minutes from meetings between 30 April and 25 June dealing with the controversial events. McKeeva Bush accused the Port Authority on 25 June last year of being the source of the leaked MOU. Expressing his disappointment, he told Paul Hurlston, the port director, and his deputies, Clement Reid and James Parsons, that he was going to have the police look into the leak as it was a serious matter. However, an RCIPS spokesperson confirmed Friday in the wake of the release of the minutes that the police had never received such a request from the premier. It was also at this meeting that the premier revealed that he intended to remove some members from the board as he had lost confidence in their ability to be impartial about the cruise facility negotiations when it came to GLF and CHEC. The documents show the extent of the tensions between all of the board members and in particular the board’s chair, Stefan Baraud, with the premier over the decision to pull out of talks with GLF construction and begin negotiations with CHEC. The members were particularly concerned about the implications of the legal action which GLF Construction had threatened to take. The legal issues caused alarm to the board members because of the liability they believed they could face as well as the detrimental impact such action could have on the country as a whole. The members also believed that it could hold up the development of the facilities indefinitely. As a result, they had all agreed at a meeting on 24 June, the day before the meeting with McKeeva Bush on the 25 June, that they would tell the premier they wanted to go back to the GLF proposal. The deputy chairman,Woody Foster, stated in the 25 June meeting that he had been uncomfortable with the way the process had gone since the initial selection of DECCO and had already expressed those concerns to the premier. As a result of not planning to serve a full term on the port board, the minutes record that Foster took the opportunity to step down there and then. Despite the position of the board, the legal advice from the authority's lawyers and a report from KPMG all advising against the premier’s decision, the board membership was changed and Bush continued on with the CHEC negotiations. Although he had taken charge of those talks initially, more recently George Town back bench MLA Elio Solomon has been at the forefront of the talks with the Chinese. At this stage, some ten months after GLF said it was weeks away from being able to mobilize and begin the pier development, there is still no agreement in place with government and a developer for the cruise facilities. (CNS): The documents that had been at the centre of a controversial freedom of information request, which almost turned into a court room drama, have finally been released by the Port Athority. The publicauthority informed CNS on Friday afternoon that the documents that were the subject of the information commissioner’s December hearing were all now in the public domain. In a release defending its right to take a “cautious and considered” approach to the disclosure of “commercially sensitive, confidential or legally privileged information”, the port said it was committed to transparency. Minutes of the Port Authority board meetings between April and June relating to GLF Construction have now been posted on the port’s website, as well as the statement about the port's handling of the particular request and the subsequent public comment. The authority had originally declined to release the documents in response to an FOI, but after a hearing Information Commissioner Jennifer Dilbert ruled that the documents should be released. After 45 days the documents were still not public and because the original applicant withdrew the request the commissioner did not force the authority to publish the documents, many of which by this time had already been leaked into the public domain. However, CNS made a new request for the document and Dilbert ordered the authority to immediately release them as per her original decision. But the minutes, which had still not been leaked, remained under wraps. Dilbert contemplated court action but in the interests of a speedier resolution she advised that the authority could follow the usual process with the CNS request, giving them up to 30 days to release the documents from the date of the request. The Port Authority posted the minutes on its site on Friday afternoon inside the thirty day time period and notified CNS. It also posted a statement in which it said the port had been the subject of comment and speculation over the request, and although it believes it has no obligation to respond, it said it was committed to the principles of accountability, transparency and public participation, as enshrined in the Freedom of Information Law. The minutes reveal the dispute and tensions which emerged between the premier and the board members over his decision to cease talks with GLF Construction and move into negotiations with the China Harbour Engineering Company for the development of the cruise berthing facilities in George Town. The minutes also show that Bush had planned on reporting the leak of the MOU between him and CHEC to the police as he believed it had come from inside the port. The documents confirm the wide speculation about the significant level of concern the members of the board had over the premier’s decision to partner with CHEC and the unanimous support that the board had for continuing the talks with GLF.